CERN and Bologna, Italy, 4 June 2018. 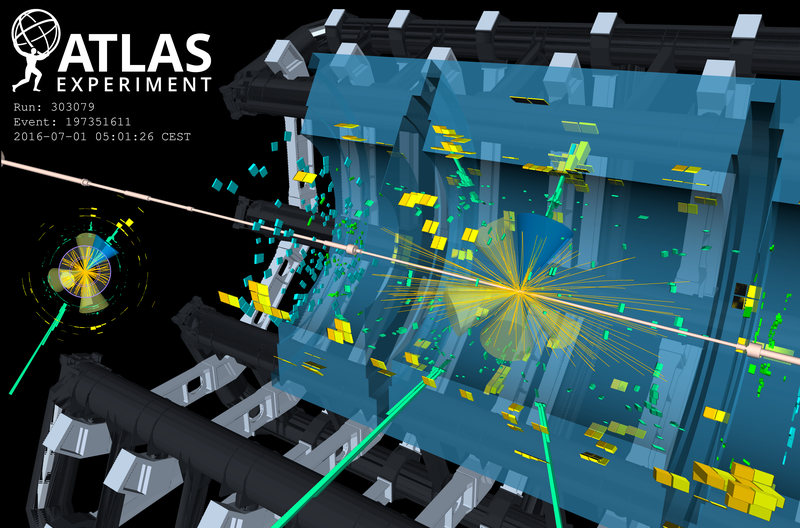 The ATLAS Collaboration at CERN has announced the observation of Higgs bosons produced together with a top-quark pair. Observing this extremely rare process is a significant milestone for the field of High-Energy Physics. It allows physicists to test critical parameters of the Higgs mechanism in the Standard Model of particle physics. The result exploits the full dataset delivered to ATLAS by the Large Hadron Collider (LHC) and establishes the signal with a statistical significance of 6.3 standard deviations. It concurs with a recent observation by the CMS Collaboration with a significance of 5.2 standard deviations using a smaller dataset. “This measurement constitutes a landmark achievement in the exploration of the Higgs mechanism and the interaction of Standard Model particles with the Higgs boson,” says Karl Jakobs, ATLAS Spokesperson. “It provides direct evidence that the heaviest known particle, the top quark, interacts with the predicted large strength with the Higgs boson.” The signal for this production has slowly built up over years of accumulating data, with first evidence reported by ATLAS last December. The result exploits the full dataset delivered to ATLAS by the Large Hadron Collider and establishes the signal with a statistical significance of 6.3 standard deviations. The success of this result hints at the new analysis possibilities of the ATLAS experiment. Thanks to the wealth of data being produced by the LHC and the excellent performance of the ATLAS experiment, physicists will be able to study the Higgs boson in further rare and experimentally challenging interactions for the first time. Such studies will continue to challenge the limits of the Standard Model and may open new avenues of discovery.